The α-carboxylic acid group of amino acids is a weak acid, meaning that it releases a hydron (such as a proton) at moderate pH values. In other words, carboxylic acid groups (−CO2H) can be deprotonated to become negatively charged carboxylates (−CO2− ). The negatively charged carboxylate ion predominates at pH values greater than the pKa of the carboxylic acid group (typically around 2.2 for the 20 common amino acids; see the table of amino acid structures above). In a complementary fashion, the α-amine of amino acids is a weak base, meaning that it accepts a proton at moderate pH values. In other words, α-amino groups (NH2−) can be protonated to become positively charged α-ammonium groups (+H3N−). The positively charged α-ammonium group predominates at pH values less than the pKa of the α-ammonium group (mean for the 20 common α-amino acids is about 9.4). Because all amino acids contain amine and carboxylic acid functional groups, they share amphiprotic properties. Below pH 2.2, the predominant form will have a neutral carboxylic acid group and a positive α-ammonium ion (net charge +1), and above pH 9.4, a negative carboxylate and neutral α-amino group (net charge −1). At a pH between 2.2 and 9.4, an amino acid typically contains both a negative carboxylate and a positive α-ammonium group, as shown in structure (2) on the right and exhibits a net zero charge. This molecular state is known as a zwitterion, from the German Zwitter meaning "hermaphrodite" or "hybrid". The fully neutral form (structure (1) on the left) is a very minor species in aqueous solution throughout the pH range (less than 1 part in 107). Altogether, amino acids exist as zwitterions in the solid phase and crystallize with salt-like properties unlike typical organic acids or amines. At pH values between the two pKa values, the zwitterion predominates, but coexists in dynamic equilibrium with small amounts of net negative and net positive ions. At the exact midpoint between the two pKa values, the trace amount of net negative and trace of net positive ions exactly balance, so that average net charge of all forms present is zero. This pH is known as the isoelectric point pI, so pI = ½(pKa1 + pKa2). The individual amino acids all have slightly different pKa values and therefore have different isoelectric points. For amino acids with charged side chains, the pKa of the side chain is involved. Thus for Asp or Glu with negative side chains, pI = ½(pKa1 + pKaR), where pKaR is the side chain pKa. Cysteine also has potentially negative side chain with pKaR = 8.14, so pI should be calculated as for Asp and Glu, even though the side chain is not significantly charged at physiological pH. For His, Lys, and Arg with positive side chains, pI = ½(pKaR + pKa2). Amino acids have zero mobility in electrophoresis at their isoelectric point, although this behaviour is more usually exploited for peptides and proteins than single amino acids. Zwitterions have minimum solubility at their isoelectric point, and some amino acids (in particular, with non-polar side chains) can be isolated by precipitation from water by adjusting the pH to the required isoelectric point. Although D-isomers are uncommon in live organisms, gramicidin is a polypeptide made up from mixture of D- and L-amino acids. Other compounds containing D-amino acid are tyrocidine and valinomycin. These compounds disrupt bacterial cell walls, particularly in Gram-positive bacteria. 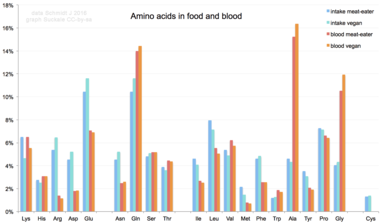 Only 837 D-amino acids were found in Swiss-Prot database (187 million amino acids analysed). When taken up into the human body from the diet, the 20 standard amino acids either are used to synthesize proteins, other biomolecules, or are oxidized to urea and carbon dioxide as a source of energy. The oxidation pathway starts with the removal of the amino group by a transaminase; the amino group is then fed into the urea cycle. The other product of transamidation is a keto acid that enters the citric acid cycle. 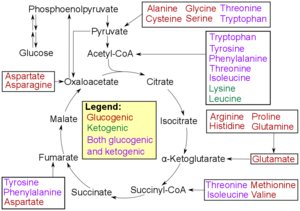 Glucogenic amino acids can also be converted into glucose, through gluconeogenesis. Of the 20 standard amino acids, nine (His, Ile, Leu, Lys, Met, Phe, Thr, Trp and Val) are called essential amino acids because the human body cannot synthesize them from other compounds at the level needed for normal growth, so they must be obtained from food. In addition, cysteine, taurine, tyrosine, and arginine are considered semiessential amino-acids in children (though taurine is not technically an amino acid), because the metabolic pathways that synthesize these amino acids are not fully developed. The amounts required also depend on the age and health of the individual, so it is hard to make general statements about the dietary requirement for some amino acids. Dietary exposure to the non-standard amino acid BMAA has been linked to human neurodegenerative diseases, including ALS. ^ Fennema OR (19 June 1996). Food Chemistry 3rd Ed. CRC Press. pp. 327–8. ISBN 978-0-8247-9691-4. ^ Savelieva KV, Zhao S, Pogorelov VM, Rajan I, Yang Q, Cullinan E, Lanthorn TH (2008). Bartolomucci A (ed.). 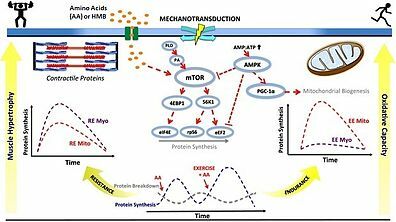 "Genetic disruption of both tryptophan hydroxylase genes dramatically reduces serotonin and affects behavior in models sensitive to antidepressants". PLOS ONE. 3 (10): e3301. Bibcode:2008PLoSO...3.3301S. doi:10.1371/journal.pone.0003301. PMC 2565062. PMID 18923670. Doolittle RF (1989). "Redundancies in protein sequences". In Fasman, G.D. (ed.). Predictions of Protein Structure and the Principles of Protein Conformation. New York: Plenum Press. pp. 599–623. ISBN 978-0-306-43131-9. LCCN 89008555.